Wages for Tri-Cities private sector workers were a mixed bag in February. The average in the three-county Johnson City Metropolitan Statistical Area (MSA) continued an upward trend while Kingsport-Bristol workers saw slimmer pay checks for the fourth straight month. In fact, the Kingsport-Bristol’s average has been in negative year-over-year territory since the first of the year. It’s the first time in 25 months that’s happened. 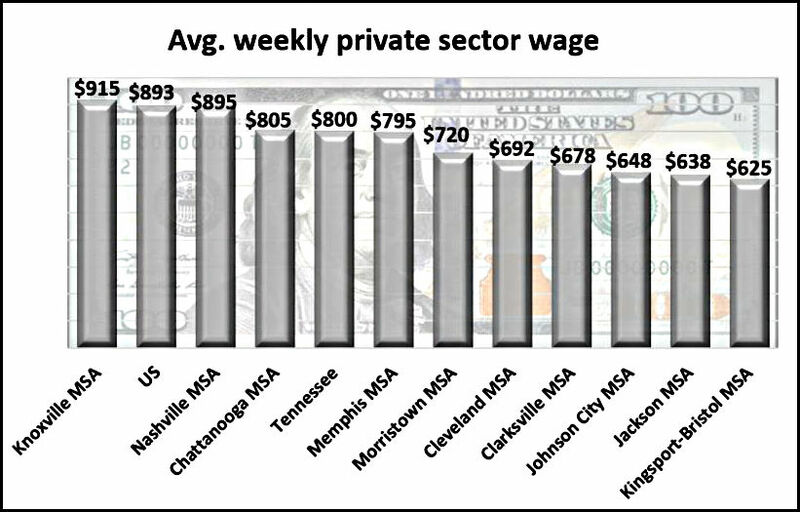 The four-county MSA also claimed the dubious distinction of having the lowest average private sector wage among all Tennessee MSAs in February despite the fact that its largest county – Sullivan – has the highest all sectors average weekly wage in the Tri-Cities. 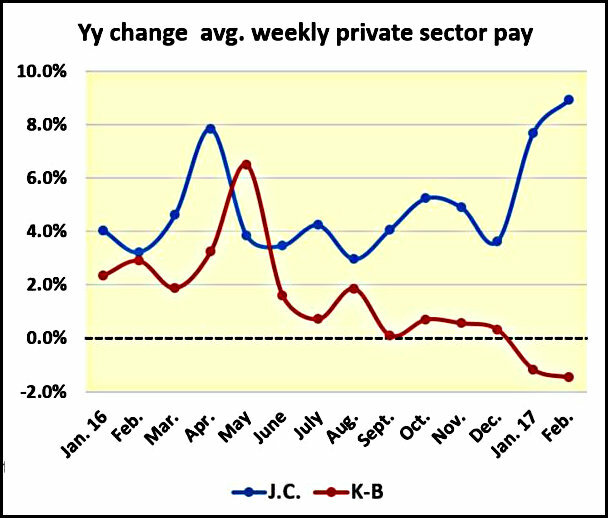 According to the current Bureau of Labor Statistics wage report, the weekly average for private sector workers in Kingsport-Bristol is $624, down $9 from February last year. The Johnson City MSA February average was $648, a $53 improvement over February last year. Wages in the three-county Johnson City MSA have made a strong comeback after four straight annual declines during the soft recovery from the Great Recession. Last year’s annual average was $615 a week – a 4.2% improvement from the 2015 average. Kingsport-Bristol workers did better during the recovery, until last year. Since January 2016 the Johnson City metro weekly average has outperformed Kingsport-Bristol in all but one month. A broader view of the of local wage conditions is provided by the county level average weekly wage for all wages. The most recent report for the Johnson City metro area shows the wage in two of the three counties was higher than February’s private sector average. The highest – $789 – was in Unicoi County. Washington County’s average was $771, and Carter County had an average of $624. Kingsport-Bristol’s average was pulled down by lower wages in the MSA’s two Virginia Counties – Scott and Washington. Sullivan County had the highest average for Tri-Cities Counties – $879 a week. The Hawkins County average was $761. Washington County VA had a $700 a week average while the Scott County average was $614 a week.